While writing a short preview for Afro Samurai 2 a couple of months ago, I remember diving into the show's wiki for a bit of background information—although I didn't understand much of what I found. There was a lot of stuff about hip-hop and robots and undead samurai, and I seem to recall that Kuma—the new protagonist for this belated sequel—is both a robot and a zombie. He's a double threat. He's also a dual-katana-wielding killer who wears a Frank Sidebottom-style cartoon head at all times. What I'm saying is that Afro Samurai 2 has finally been 'officially' announced, with a very short trailer that sets up the story. What it doesn't tell you—and I remember this from my preview looksie—is that the first game's bigged-up dismemberment system appears to be out the door, Samuel L Jackson might be involved, and that Kuma has three different fighting styles. (You'll need to frequently switch between them to wail on enemies.) Oh and worry not: RZA is still doing the soundtrack. 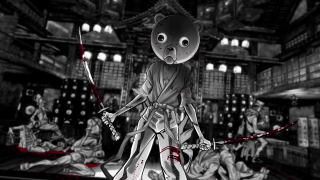 Afro Samurai 2: Revenge of Kuma is coming "later this year".